Norwegian Joy is expected ot be christened on June 27, 2017. This luxury Norwegian Cruise Line (NCL) ship becomes the first one built for the growing Chinese market. If you like car racing, you will really love the awesome Ferrari branded race track! In partnership with Ferrari Watches and ​Scuderia Ferrari Watches, Norwegian Cruise Line has developed the very first racetrack at sea. Located on the top deck of the new Norwegian Joy cruise ship, the Ferrari branded race track covers two-levels. Adjacent to the track, shop for Scuderia ​Ferrari Watches in the retail store. When the NCL Norwegian Joy cruise ship sets sail on its maiden voyage, 3,850 passengers will have a VIP experience in sleek, electric go-carts. The goal of the Norwegian Joy cruise ship is to offer “First Class at Sea” experiences. I’m sure you will agree that flying around the Ferrari branded race track in the middle of the ocean meets that criteria. Up to ten ​drivers ​can race at one time. What a cool way to have fun. Race each other and when done, your picture will be taken at the finish line to capture your experience. If you are staying in the ship’s The Haven and Concierge class, you will receive a number of complimentary rides. The ​Norwegian Joy call both ​Shanghai and ​Tianjin, as her home port. The christening ​ceremony in June should be an unbelievable event. It’s exciting to know that the “King ​of Chinese Pop” ​Wang ​Leehom will be featured. All of the luxury cruise ship’s experiences and amenities have been tailored specifically to the vacation desires of Chinese guests. Expect the best accommodations available. For example, The Haven by Norwegian is NCL’s exclusive, ship-within-a-ship suite luxury complex. Guests will enjoy an all-new Observation Deck. As a result, you can expect amazing 180 degree views. experience. With endless luxury amenities and larger balcony staterooms, it will be like living in royalty style. The luxury cruise ship offers staterooms designed especially for families. Another nice option is a connected stateroom. Therefore, perfect for extended family passengers or large groups. 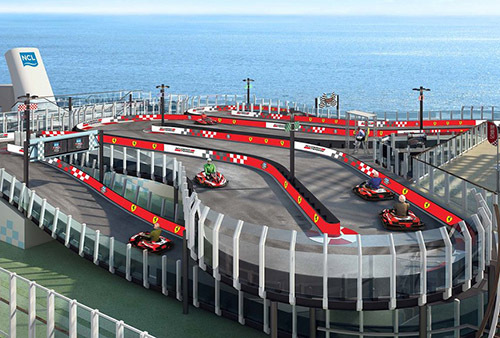 In addition to the awesome two-level Ferrari branded race track, cruise passengers can enjoy an open-air laser tag course, interactive video walls, two multi-story water slides, plus thrilling simulator rides. To get some time alone, stroll in the peaceful open space park. If shopping is your passion, you are in luck. The Norwegian Joy will feature a large, upscale shopping district. It is the biggest among all NCL cruise ships. Stroll along and choose from the best luxury retail brands, in addition to duty-free shops. A great way to pick up the perfect luxury gift or simply shop for yourself. To enjoy the Ferrari branded race track, please contact us to book a luxury cruise on the new Norwegian Joy cruise ship. Come back again to read more luxury travel stories, here in our luxury blog.